These cameo earrings in the Roman Revival style are of hardstone, an indicator of their quality. Gold filigree and granulation border the ladies in profile, further emphasizing cameos as miniature works of art. The small, low relief sculptures we recognize as cameos date to antiquity, used in Classical Greece and Rome to depict portraits and mythological scenes. There were many cameo revivals over the ages, particularly in the Renaissance and eighteenth-century. 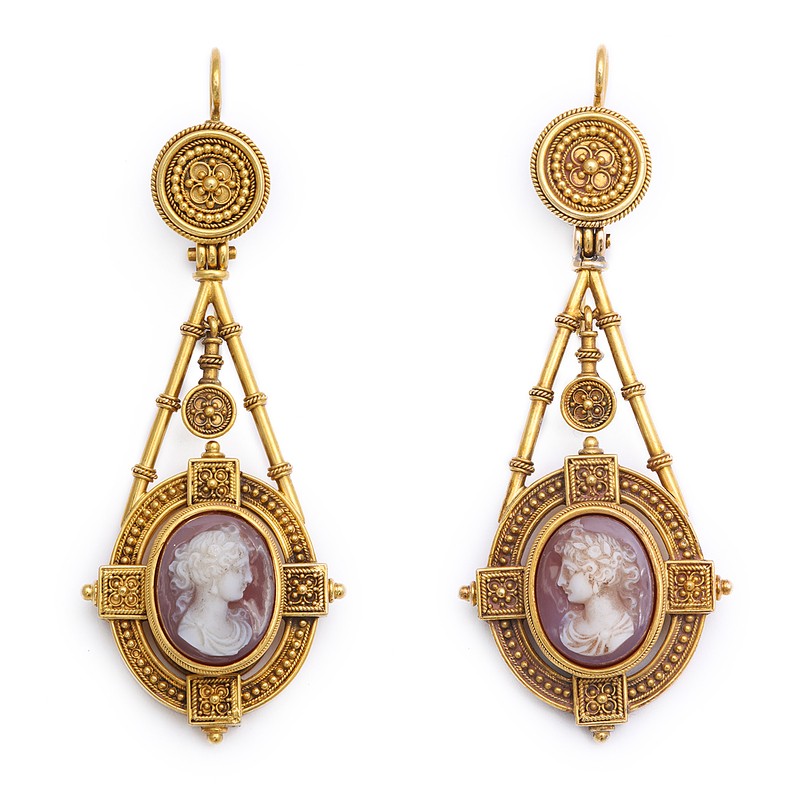 In the nineteenth-century, cameos became widely coveted for use in personal adornment. In the Victorian era, cameos became especially revered as travel souvenirs and wearable sculptures. Many cameo jewelry designs were inspired from sculpture, a highly regarded art form in the Victorian period for use as architectural accents. Cameos were traditionally made from hardstone. Commonly varieties of agate, such as onyx, sardonyx, and jasper, enabled a cameo carver to create an image in more than one color because of their multiple layers. Cameos were also carved from shell, a light weight material conducive to jewelry making. Such easy manufacture made cameos more accessible to the growing middle class, therefore increasing their popularity. Beautiful and timeless, cameos are a window to the past and a fitting accessory for the present!